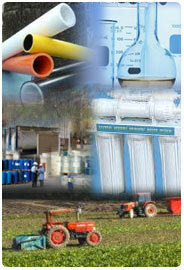 Vibrant Industries focuses on Trading and Farming. Trading & Distribution is the core business of Vibrant Industries. Focus of Trading is on Infrastructure Products (Pipes & Water Treatment Systems) and periodically identifying new & emerging products. Being extremely committed to the environment, Vibrant Industries contributes to an environmental friendly atmosphere at all times by targeting green products to the market. Multi Layer Composite (MLC) pipes being produced with IS:15450 standards. Composite Pipes combine the advantages of metal and plastic pipes and eliminate the disadvantages of both materials at the same time. Vishveswarar Farms is a division of Vibrant Industries that focuses on Farming Activities. Currently fruits and vegetables are being cultivated in Vishveswarar Farms. Copyright © 2014 Vibrant Industries Limited. All rights reserved.